In conjunction with the airing of the new national PBS documentary, Latino Americans, WCNY is showcasing the contributions of Latino Americans of Central New York with its Latino Americans in Central New York Awards. The following profiles also can be seen on WCNY-TV. MariaLourdes Fallace is a leader and trailblazer. She was the first Latina to head a city department, she served as the Executive Director of the Syracuse Commission for Women, and she managed a successful Youth Mentor Program for middle and high school female students attending city schools. Fallace developed the “Medical Spanish” program for students at SUNY Upstate Medical University, teaching them about Hispanic culture and how to develop trust with patients by communicating in Spanish. She has also assisted migrant workers with health and labor issues. Bethaida “Bea” Gonzalez was born in Puerto Rico, and her migrant farmworker parents settled in Syracuse when she was three years old. Gonzalez was the first in her family to receive a high school diploma and went on to earn a bachelor’s degree in political science and Latin America studies from SUNY Binghamton and a master’s degree in public affairs from Syracuse University. For the past 30 years, Gonzalez has worked at Syracuse University, starting as an academic counselor and rising through the ranks to become Dean of University College, a position she holds today. In addition, Bea has served on the Syracuse City School Board and became the first Latina to be elected president of the City of Syracuse Common Council. Her leadership extends to a number of non-profit organizations. She serves on the New York State Fair Advisory Board, is vice president of the Eleanor Roosevelt Committee and president of the University Professional & Continuing Education Association. Gonzalez has won numerous awards for her work in and for the Hispanic community including the Hispanic American of Distinction in New York State Award. Volunteerism is an important ingredient in community life, and Nestor Rivera has earned recognition for his selfless volunteer efforts. Rivera was born in Puerto Rico and came to the United States as a young child. He lived in New York City until 1977, when he came to Syracuse to live with his Aunt Ana and other family after the death of his mother. As a man with a developmental disability, Rivera has been employed through Monarch Enterprises for many years, but he wanted to be busier. He became a volunteer at St. Lucy’s Food Pantry, beginning by working one day a week. Today, he works three days each week stocking shelves, cleaning and, most importantly, serving as an interpreter for the pantry’s Spanish-speaking guests and its non-Spanish-speaking staff and volunteers. He is a link that connects people in our community. Iluminada “Lucy” Tedeschi was born in Havana, Cuba, and came to the United States in 2004 through the government’s refugee program. Her accounting experience in Cuba landed her a job in Syracuse at LaLiga. She continues to work there as a Housing Specialist/First Time Home Buyer Educator, assisting members of the Hispanic community to find suitable safe and affordable homes and advocating for housing rights. Tedeschi is also a friend to her clients, instilling optimism and confidence in them. 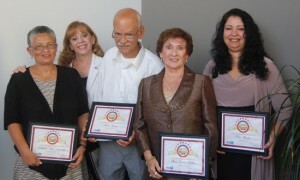 She has received the agency’s Employee of the Year award in recognition of her commitment and dedication. In 2009, Tedeschi proudly became a U.S. citizen. For nine years she tirelessly worked to be reunited with her daughter – a goal she happily achieved in 2012. 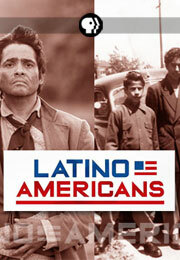 Latino Americans is a landmark six-hour documentary featuring interviews with nearly 100 Latinos and more than 500 years of History. It’s the first major documentary series for television to chronicle the rich and varied history and experiences of Latinos, who have helped shape North America over the last 500-plus years and have become, with more than 50 million people, the largest minority group in the U.S.
Latino Americans is a production of WETA Washington, D.C.; Bosch and Co., Inc.; and Latino Public Broadcasting (LPB); in association with Independent Television Service (ITVS). The series executive producers are Jeff Bieber and Dalton Delan for WETA, Sandie Viquez Pedlow for LPB, and Sally Jo Fifer for ITVS. The series producer is Adriana Bosch. The supervising producer is Salme López. The producers are Nina Alvarez, Dan McCabe, Ray Telles and John J. Valadez. The associate producers are Sabrina Avilés, Yvan Iturraga and Monika Navarro. For the re-enactment sequences, the producer is Cathleen O’Connell and the directors are David Belton and Sonia Fritz. The production manager is Mary Sullivan. Corporate funding for Latino Americans is provided by The Ford Motor Company. Major funding is provided by Corporation for Public Broadcasting (CPB) and Public Broadcasting Service (PBS). Foundation support is provided by Ford Foundation, National Endowment for the Humanities, The Rockefeller Foundation, The Arthur Vining Davis Foundations, The Annenberg Foundation and The Summerlee Foundation. Funding for outreach is supported by a grant from The New York Community Trust. Sept. 15 kicks off National Hispanic Heritage Month, which recognizes Hispanic and Latino American heritage and culture. The month actually began as a week in September of 1968 when Congress authorized President Johnson to proclaim a time set aside to salute Hispanic culture. It was expanded in 1989 by Congress as a month-long celebration of the traditions and culture of those who trace their roots to Spain, Mexico and the Spanish-speaking nations of Central and South America and the Caribbean. The month kick-off on Sept. 15 was chosen because it marks the independence anniversaries of five Latin American countries: Costa Rica, El Salvador, Guatemala, Honduras and Nicaragua. In addition, Sept. 16 and Sept. 18 are the dates for Mexican and Chilean independence respectively. According to a July, 2013 Gallup poll, the majority of people , 70 percent, don’t care which of the terms are used. But Latino seems to be growing in popularity, at least in the media. “Hispanic” comes from a Latin word for Spain “Hispania” and which later became known as “España”. It refers to the Spanish-speaking people of North, Central, and South America whose first language is Spanish and were colonized by Spain. It is the term used by the U.S. Census Bureau. Latino is shortened from the Spanish term Latino Americano, “Latin American” thus narrowing the scope of meaning to immigrants and their descendants living in the Untied States from Central and South America, and Spanish speaking Caribbean Islands. According to the Pew Hispanic Center, based on polling, most Hispanics identify themselves primarily by country of origin, rather than a broader term like Hispanic or Latino. Latino Americans are making Central New York their home in growing numbers, according to U.S. Census figures. 4.3 percent of Onondaga County residents are Hispanic/Latino; in Tompkins County 4.6 percent (in the city of Ithaca the figure is 6.9 percent) and in Utica, in 10 years time, the percent of Latino Americans has nearly doubled to its present 10.53 percent. Hispanics have emigrated to Central New York since the 1800s. In the Mohawk Valley, for example, they found work on the Erie Canal and the railroads, in factories, and seasonally on farms. In the city of Syracuse, the Near West Side, where WCNY is located, is home to growing Latino community with much of that growth coming from Puerto Ricans and Cubans. In the United States, there were 52 million Hispanics in 2012, constituting 17 percent of the population, according to the U.S. Census, making people of Hispanic origin the largest ethnic or racial minority group in the country. Only Mexico, with about 112 million people, has more Hispanics than the United States. New York was one of eight states with a Hispanic population of one million or more. Many Central New York communities have organizations that have formed to assist Latino Americans in finding employment, improving language skills, securing housing, or starting businesses. Other groups are dedicated to celebrating Hispanic culture and traditions. On the Near West Side of Syracuse, for example, The La Casita Cultural Center was established to create a bridge between Syracuse University and the Latino community in Syracuse. The Center is “committed to promoting and documenting the arts and culture of Central New York’s Latino/Latin American community through collaborative programming in the visual and expressive arts, education, and community activism.” La Liga, the Spanish Action League of Onondaga County, which dates to 1969, states as its purpose “to build on the rich cultural heritage of the Latino community by advancing its independence and growth through advocacy, counseling and education.” There are other community groups as well including a Latin Professional Network, radio stations, and a bilingual monthly newspaper, CNY Latino.